For reasons unknown to me, my email address ended up on a list that landed in the hands of the makers of “a meal and snack measuring tool” called “PortionMate.” I was contacted with an email that seemed more or less targeted at individuals who run healthcare facilities–or perhaps for dieticians and other providers to use with their patients. However, as I do not run such a facility and my students do not count as patients, it seemed I was not their target demographic. Nevertheless, the content on their website seemed interesting, so I emailed them back. I told them about this blog, and said that if they’d send me a set of the measuring rings–more on that in a moment–I’d be willing to write up a review on my blog. Now, it’s not exactly the type of health policy and health services research content that you typically find here, but if people would eat better, and lose weight, it would go farther in improving health outcomes than most anything we have achieved through policy of late. They agreed, and within a week or two, I got a kit delivered to my door. I should also disclose that, other than the free kit, I was not compensated in any way for writing this review. Consider it a public service. 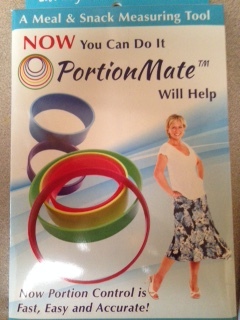 The basic idea behind PortionMate is that we have no idea what appropriate serving sizes should look like. Sure, we can read the side of the package, but as comedian Brian Regan jokes about ice cream, some guy probably put “1/2 cup” on the container as a joke, but now it’s already packed on all the trucks and it’s going out like that. In other words, we don’t adhere very closely to the serving sizes on the nutrition labels. To make it easier for us, you’ll often hear guidelines like “Eat a serving meat the size of the palm of your hand.” The problem with that, of course, is that we all have differently sized hands. 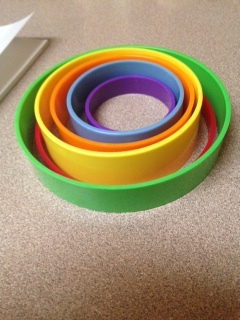 PortionMate basically takes this concept and standardizes it, using a series of 6 differently colored and differently sized rings (see below). As laid out clearly in the accompanying booklet, the green ring is roughly 1 cup, and is for fruits and vegetables. The yellow ring is 3/4 cup, and is for cereal and fruit. The orange ring is 1/2 cup, and is for fruits, vegetables, cereal, and beans. The blue ring is 1/3 cup, and is for cooked grains and starchy vegetables. The red ring is about 3 ounces, and is used for measuring protein (i.e., meats). Finally, the purple ring is about 1 ounce, and is used for measuring nuts, seeds, dried fruits, and cheese. As you can see from my little experiment, however, it is very important to use the correct ring for the correct food type. 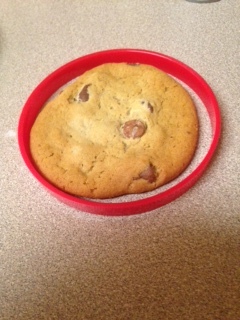 Sadly, while the chocolate chip cookie fits easily within the red ring, I don’t think this is a correct use of the product, and none of the rings are allocated for use with sweets (if you exclude fruit). That, as far as I’m concerned, is a flaw in the product. My other main issue with this product is that I don’t see how it adds much value. For example, I’ve used the MyFitnessPal app to keep a food diary, and it pulls in all of the actual nutritional information from everything I eat. All I have to do is make sure to measure the serving size. So, for example, it is easier for me to pour cereal into a measuring cup and then dump it into the bowl–and likewise for the milk–than it is for me to use the yellow ring. On top of that, not all cereal serving sizes are 3/4 cup. Some are 1 cup. So I’d have to remember when to use the yellow ring and when to use the green ring. But the biggest problem is that there’s no bottom in the ring. Of course, if there were, it would be a measuring cup. That said, I think that it could be a useful tool for gauging portion size of things like steaks, that aren’t as easily measured. Sure, you can go off the weight, but fitting it inside the ring is easier. The same might be true for other foods that I can’t think of right now off the top of my head. The bottom line? There is nothing “wrong” with this measuring tool. Indeed, it might even work well for you. I think the point might be to train you what proper serving sizes of various foods look like. And, in that respect, if used consistently, I think it would work very well. I, however, will continue to use measuring cups, and iPhone apps. It’s widely known that it costs a lot more to live in some parts of the country than others. Off the top of your head, you can probably name New York, San Francisco, and Washington, D.C. as examples of cities where it is extremely expensive to live. Of course, that’s just the tip of the iceberg. It’s not like Boston, Chicago, or Los Angeles are particularly cheap. Generally speaking, big cities are more expensive. A large part of that is likely supply and demand. When a bunch of people want to live somewhere, and the amount of habitable space is finite, the cost of that space goes up, and that tends to drive up the costs of everything else in turn. But this also happens on a slightly more macro scale. That is, some regions of the country are more expensive than other regions of the country. For example, the coasts typically have higher costs of living than inland areas, and the northeast and west parts of the country tend to be more expensive than the south or midwest. In a recent Health Affairs paper, Brendan Saloner and colleagues report the results of an experiment in which a group of actors pretended to be uninsured and made phone calls to attempt to schedule a new patient primary care appointment and find out what it would cost. As the title of their article gives away right from the start, the “average price was $160.” That’s not a particularly shocking number to most of us who have a sense of health care charges, but for the uninsured individual who’s not insulated from those costs, that’s a lot of money to pay to see the doctor for what might amount to about 12 to 15 minutes’ worth of a visit. The thing I found most interesting, though, was the geographic variation in prices they identified. While they report both the mean and the median costs in their paper, I’m going to focus here on the median costs, because that figure isn’t affected by outliers in the way that the mean can be. The authors investigate the cost of new patient appointments in 10 different states: Arkansas, Georgia, Iowa, Illinois, Massachusetts, Montana, New Jersey, Pennsylvania, Oregon, and Texas. While that’s just a sample of the country, it does a decent job at capturing the various regions of the United States. I grew curious about how the median cost for a new primary care appointment compared to the cost-of-living in each state. Now, it’s not really fair to look at the overall cost-of-living, because there’s variation within that figure. For example, while city A and city B may cost more than city C, it could be because the cost of housing is much higher in city A than city C, while the cost of transportation and health care are higher in city B than city C. Fortunately, I found a cost-of-living calculator that helped me look specifically at health care costs. The calculator gives each city a score for health care costs that are standardized to a national average value, which equals 100. Thus, a city with a score less than 100 has cheaper health care than the national average, and a city with a score more than 100 has more expensive health care than the national average. So, costs are pretty much what we’d expect in Boston, Atlanta, Springfield, Trenton, and Austin. In fact, Boston is the only place where the actual cost was less than expected. It seems that the actual cost doesn’t go below $120, so places like Harrisburg and Little Rock end up costing a little bit more than expected. Helena also costs about 20% more than expected. But the big shocks are Salem and Des Moines. While Salem is expected to be the second-most expensive, it is actually the most expensive by far–a whopping 30% more costly than the next most expensive locale, Boston. And, at the other end of the spectrum, Des Moines is expected to be the cheapest of all, but it is actually the fourth most expensive on the list. That said, I reiterate that these actual numbers are from a sample within the state and do not necessarily represent the cities as I’m interpreting it here. Nevertheless, it demonstrates that variation in health care costs don’t even necessarily reflect the differences in health care costs we know to exist. That is, there’s variation on top of the variation. Just one of the many reasons why it can be so difficult for people to navigate the health care system, particularly if they’re uninsured. Head over to Boston Health News and check out the latest version of the Health Wonk Review. It’s a good one–and it features a link to my piece about my Dad and the Give 1 For Dad campaign–just in time for Father’s Day! Sunday is Father’s Day. It’s a day that means a lot more to me now that I’m a father myself. That’s not only because I get to delight in the joy of having a daughter, but also because being a parent allows me to be more appreciative of my own father. I am now experiencing some of the thoughts and feelings that he must have had–and maybe still has. Things like fear and joy–fear that I’d be born healthy, stay safe, grow up to have a career and a family, develop a deep Christian faith of my own–and joy at being called Daddy, of being welcomed home from work, of getting asked to build forts at bedtime, and sharing laughs in silly moments. So, for Father’s Day, my gift to my Dad is to reflect on what he means to me, share that with him (and you), and make a gift that will honor him and hopefully help many dads in the process. We’ll get to all that in a moment, but first let me tell you about my Dad. My Dad isn’t a stereotypical dad. He doesn’t hunt or fish. He doesn’t fix things around the house. He doesn’t drink beer or work on cars. He is not–and never was–very athletic (although he used to be pretty good at tennis when I was little). Probably the most stereotypical “dad” thing about my Dad is that he watches a lot of sports on TV. In fact, that’s basically the theme of the card I’m sending him this year. My Dad grew up on the grounds of a resort–where his father was the hotel’s president–and he went on to attend the Cornell Hotel School–graduating as the Valedictorian of his class. He’s worked at the Key Biscayne Hotel, the Mulberry Inn in Savannah, the Clock Tower Resort in Rockford, IL, and the King & Prince Beach Resort in St. Simons Island, GA just to name a few. At one point, he ended up without a hotel management job and sold life insurance to make ends meet. These days he’s an Assistant Professor of Hospitality and Culinary Arts–a role he has poured himself into and in which he truly excels. Having a non-traditional Dad means that there’s a lot of stuff I’ve had to learn the hard way–through trial and error–and a lot of stuff I still don’t know. I showed up at little league throwing “like a girl.” At a friend’s birthday party, I drove a four-wheeler into a pine tree. I shot a score of 120 in an 18-hole high school golf match. I had to outsource help in building my pinewood derby cars for Boy Scouts. I was the starting point guard for the math team. It wasn’t until after college that I learned how to change the oil in my car. You get the picture. Then again, my Dad taught me an awful lot. He taught me how to keep score at a baseball game. How to do my taxes. How to solve for X when I was learning algebra. He taught me the value of hard work and the value of a dollar. He taught me the importance of loyalty to friends and family. He awkwardly taught me about the birds and the bees one afternoon on the way to Winn-Dixie. He impressed upon me the utmost importance of living one’s life before an audience of One. He taught me intentionally–and whether or not he knew it, he taught me unintentionally whenever he made the mistakes all of our parents inevitably make. The ones we promise ourselves we will never replicate if we ever have children of our own. The promises we then proceed to break with regularity. In all of this, in his own way, he showed me–shows me still–that he loves me. One memory stands out as especially prominent in that regard. It was many years ago, and there was a “Dad and Lad” camping trip for the Boy Scouts. I’d grown up camping with my Mom’s side of the family, but my Dad was always conspicuously absent from those trips. Yet, when it was time for the “Dad and Lad” trip, he went with me. We were only there for a couple of days, but it was cold, rainy, and miserable. We slept on cots under a canvas tent, barely able to escape the rain, and entirely unable to escape the mosquitoes. We shot rifles. We did a woodworking project. We sang campfire songs that were uncomfortably childish for all involved. All of these things took my Dad way outside of his element–beyond sight of his comfort zone–yet he did them for me out of love. That is but one memory of many that I cherish. And, so, out of my love for him, I’m doing something differently this Father’s Day. This year, there will be no necktie, no book, no gift card to Amazon. Instead, I’m giving a donation to an important charity in honor of my Dad. The charity is called Give 1 For Dad. It was started by the husband of a friend of mine in Durham, North Carolina. His dad has prostate cancer and is running out of options. The goal of the charity is to raise money to fund a clinical trial of a cancer treatment protocol at the Duke Cancer Institute. The cool thing is that the protocol uses a safe generic drug that promises to be effective (as opposed to the mostly toxic compounds typically used today). The problem is that, because it uses this generic drug, none of the usual suspects (i.e., pharmaceutical companies) are willing to fund the clinical trial. Give 1 For Dad is essentially a crowdfunding endeavor with a twist. They ask that you simply give 1% of 1 day’s salary. For most people, that’s not much. For example, if your annual salary is $75,000, then your donation is just $3. By skipping a single cup of coffee, you could perhaps save the lives of many men–maybe even your own Dad. But that’s the least you can do. So ask yourself: What is your dad worth to you? Think about that, and then instead of another typical Father’s Day present, make a meaningful donation to Give 1 For Dad in his honor. Give as much as your Dad would give for you. Here’s the direct link to donate now, just in time for Father’s Day. And, if your dad is anything like my Dad, he’ll be thrilled to learn that you found a way to give him a fully tax-deductible Father’s Day gift. It came out last week, but I’m just posting a link now: Louise at the Colorado Health Insurance Insider has posted a great “Summertime!” edition of the Health Wonk Review–and it includes a post from Wright on Health, as well as a lot of other wonderful stuff. Check it out! Wonder What Would Happen If A Hospital Near You Closed? Read This. In many communities around the country, hospitals are one of–if not the–largest employers. Consequently, there are undoubtedly economic issues that would befall an area if its hospital were to close. But this post isn’t about that. It’s about the healthcare consequences, and by extension, the health consequences that might arise in a community when a hospital closes its doors. The logic is fairly straightforward: If a hospital closes, it reduces access to certain types of care. If access to care is reduced, people’s health is likely to suffer. Like many of the things I choose to write about, however, there’s the big gap that exists between intuitive thinking and empirical evidence. Fortunately, Karen Joynt and colleagues recently published a study in Health Affairs that helps to fill that gap. Specifically, they looked at nearly a decade worth of data on hospital closures nationwide between 2003 and 2011. Then they explored whether hospitalization rates or mortality rates were associated with these hospital closures. Surprisingly, they “found no evidence of an association between hospital closures and worsening outcomes for those living in the local community.” In fact, they found that hospital closure was possibly associated with a small reduction in readmission rates, which is a good thing. Since this data-driven analysis seems to run contrary to what we might assume we’d observe, the next question to ask is: what does it mean? The authors offer two distinct possibilities. First, they suggest that as long as the hospitals that closed were low-quality hospitals, then it would make sense that outcomes wouldn’t suffer. And, related to that, it would actually be a net positive, because people who were going to the low-quality hospital would now be redirected to a higher quality hospital after the other hospital closed. Of course, that assumes that there is more than 1 hospital accessible to the community experiencing the closure. If the next closest hospital is a considerable distance away, then that travel barrier may reduce access and offset what would otherwise be an improvement in healthcare quality. Second, they suggest that areas experiencing a closure had an oversupply of healthcare providers, meaning that a closure could occur without restricting access, because the local healthcare system would still have adequate capacity to provide needed care. Both explanations really point towards hospital closures being the natural consequence of a well-functioning market. That’s great news, unless you happen to work at a hospital that’s closing, in which case it’s probably very little consolation. However, that underscores the bigger lesson here: We spend far too much money on healthcare in this country. Contracting the size of the healthcare industry to save money can be done in ways that increase efficiency and don’t harm patient outcomes, but that is no guarantee that employees of the healthcare sector won’t be directly–and negatively–affected. After all, what some call healthcare expenditures, others call income. And that maxim is precisely what has made meaningful health reform and cost-control efforts so difficult. Sure, the Presidential Election is only about 18 months away, but the campaigns–especially among the crowded Republican field–are well underway. With its first in the nation primary–the Iowa Caucuses–the state I currently call home is in the news often these days as the next hopeful makes their trek to America’s Heartland. But recently, Iowa has been in the news–on a national level–for a very different reason and it’s one you should pay attention to no matter where you live, because it’s either happening in your state already, or there’s a very good chance that it will be soon. The issue is simple: Iowa wants to hand over control of its Medicaid program to private managed care organizations. There’s a popular word that often gets used for this, but I refuse to repeat it here, lest it legitimate the idea further. Last month, one of the doctoral students in my department wrote this guest post about the issue. It provides a good overview of what’s being proposed. And it’s being proposed swiftly, which should make anyone a little bit suspicious. Recently, an editorial penned in the Des Moines Register took up the issue, and this has made it’s way to the level of national news. See Exhibit A: Its mention in the Kaiser Health News Morning Briefing (you’ll have to scroll to the end of the page). The real kicker, as I see it, is that the people of Iowa–you know, the people whose tax dollars will be paying for this Medicaid program one way or the other–are highly opposed to transitioning Medicaid to managed care. As the editorial notes, “Only 22 percent [of voters surveyed] supported the idea.” Yet the Branstad Administration is moving full-speed ahead. The key phrase in that last sentence is “if it is approved.” The Federal government ultimately must approve Iowa’s waiver application for the Medicaid program to be transitioned to managed care. Rather than appeal to the Governor, who doesn’t seem to mind ignoring the wishes of the overwhelming majority of Iowans, you can make your voice heard at the Federal level. If enough pressure is applied to the Obama Administration (and CMS, specifically), there’s a chance that Iowa’s Medicaid Managed Care waiver won’t be approved, which would be a huge victory for all Iowans. To speak up and make your views known, you can contact several people, including Manning Pellanda, Director of the Division of State Demonstrations and Waivers at CMS, Vikki Wachino, Acting Director of CMS, or you can call the regional CMS office in Kansas City at (816) 426-5925. You can also visit http://www.cms.gov and send a message to the offices through the website. This matters, and you can make a difference.